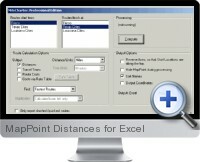 MapPoint Distances for Excel (MileCharter) is a MapPoint utility enabling to compute large numbers of travel distances between locations and output to Excel. Travel times and estimated costs are also exported to allow for valuable analysis of supply chains or sales channels. MapPoint Distances for Excel provides a variety of useful options and calculates multiple distances quickly and efficiently. Supports all versions of Microsoft MapPoint from 2006 and above. Calculates route distances, travel times and estimated costs all at the same time. Can calculate tables between all locations within one group. Supports sophisticated and flexible route cost calculations using rate tables based on mileage rates per distance range. Finds the shortest routes, fastest routes and straight line distances. Efficiently match closest destination for multiple locations. Triangular and square mileage charts are provided. Output of accurate location coordinates with the mileage table. Outputs to any version of Excel or CSV text file.